This report describes the dimerisation of glutathione, and by extension, other cysteine-containing peptides or protein fragments, with a 5, 5’-disubstituted-2, 2’-bipyridine or 6, 6”-disubstituted-2, 2’:6’,2”-terpyridine unit. The resulting bipy-GS2 and terpy-GS2 were investigated as potential metal ion dependent switches in aqueous solution, and were found to predominantly adopt the transoïd conformation at physiological pH. Metal complexation with CuII and ZnII at this pH has been studied by UV/Vis, CD, NMR and ion-mobility mass spectrometry. ZnII titrations are consistent with the formation of a 1:1 ZnII:terpy-GS2 complex at pH 7.4, but bipy-GS2 was shown to form both 1:1 and 1:2 complexes with the former being predominant under dilute micromolar conditions. Formation constants for the resulting 1:1 complexes were determined to be log KM 6.86 (bipy-GS2) and 6.22 (terpy-GS2), consistent with a higher affinity for the unconstrained bipyridine, compared to the strained terpyridine. CuII coordination involves the initial formation of 1:1 complexes, followed by 1.5Cu:1bipy-GS2 and 2Cu:1terpy-GS2 complexes at micromolar concentrations. Binding constants for formation of the 1:1 complexes (log KM 12.5 (bipy-GS2); 8.04 and 7.14 (terpy-GS2)) indicate a higher affinity for CuII than ZnII. Finally, ion-mobility MS studies detected the free ligands in their protonated form, and were consistent with the formation of two different Cu adducts with different conformations in the gas-phase. We illustrate that the bipyridine and terpyridine dimerisation units can behave like conformational switches in response to Cu/Zn complexation, and propose that in future these can be employed in synthetic biology with larger peptide or protein fragments, to control large scale folding and related biological function. Allosteric regulation and catalysis emerge via a common route. Allosteric regulation of protein function is a mechanism by which an event in one place of a protein structure causes an effect at another site, much like the behavior of a telecommunications network in which a collection of transmitters, receivers and transceivers communicate with each other across long distances. For example, ligand binding or an amino acid mutation at an allosteric site can alter enzymatic activity or binding affinity in a distal region such as the active site or a second binding site. The mechanism of this site-to-site communication is of great interest, especially since allosteric effects must be considered in drug design and protein engineering. In this review, conformational mobility as the common route between allosteric regulation and catalysis is discussed. We summarize recent experimental data and the resulting insights into allostery within proteins, and we discuss the nature of future studies and the new applications that may result from increased understanding of this regulatory mechanism. NMR Chemical Shifts of Common Laboratory Solvents as Trace Impurities. Multicolor tuning of lanthanide-doped nanoparticles by single wavelength excitation. Lanthanide-doped nanoparticles exhibit unique luminescent properties, including large Stokes shift, sharp emission bandwidth, high resistance to optical blinking, and photobleaching, as well as the unique ability to convert long-wavelength stimulation into short-wavelength emission. These attributes are particularly needed for developing luminescent labels as alternatives to organic fluorophores and quantum dots. In recent years, the well-recognized advantages of upconversion nanocrystals as biomarkers have been manifested in many important applications, such as highly sensitive molecular detection and autofluorescence-free cell imaging. However, their potential in multiplexed detection and multicolor imaging is rarely exploited, largely owing to the research lagging on multicolor tuning of these particles. Lanthanide doping typically involves an insulating host matrix and a trace amount of lanthanide dopants embedded in the host lattice. The luminescence observed from these doped crystalline materials primarily originates from electronic transitions within the [Xe]4f(n) configuration of the lanthanide dopants. Thus a straightforward approach to tuning the emission is to dope different lanthanide activators in the host lattice. Meanwhile, the host lattice can exert a crystal field around the lanthanide dopants and sometimes may even exchange energy with the dopants. Therefore, the emission can also be modulated by varying the host materials. Recently, the advance in synthetic methods toward high quality core-shell nanocrystals has led to the emergence of new strategies for emission modulation. These strategies rely on precise control over either energy exchange interactions between the dopants or energy transfer involving other optical entities. To provide a set of criteria for future work in this field, we attempt to review general and emerging strategies for tuning emission spectra through lanthanide doping. With significant progress made over the past several years, we now are able to design and fabricate nanoparticles displaying tailorable optical properties. In particular, we show that, by rational control of different combinations of dopants and dopant concentration, a wealth of color output can be generated under single-wavelength excitation. Strikingly, unprecedented single-band emissions can be obtained by careful selection of host matrices. By incorporating a set of lanthanide ions at defined concentrations into different layers of a core-shell structure, the emission spectra of the particles are largely expanded to cover almost the entire visible region, which is hardly accessible by conventional bulk phosphors. Importantly, we demonstrate that an inert-shell coating provides the particles with stable emission against perturbation in surrounding environments, paving the way for their applications in the context of biological networks. 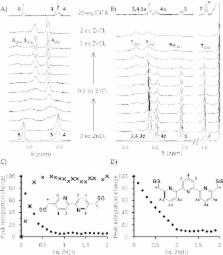 High affinity agonistic metal ion binding sites within the melanocortin 4 receptor illustrate conformational change of transmembrane region 3. Poly(ethylene glycol) doubly and singly cationized by different alkali metal ions: relative cation affinities and cation-dependent resolution in a quadrupole ion trap mass spectrometer.